EAST PARK - Monday, July 2, 2018, 8 P.M.
INSTITUTE PARK - Sunday, July 8, 2018, 7 P.M.
INSTITUTE PARK - Sunday, July 15, 2018, 7 P.M.
Saturday, November 3, 2018, 7:30 P.M.
Celebrated area keyboard artists play the Orchestra's two magnificent pianos - its vintage 1902 Steinway Model "C" concert grand piano and the new Steinway Model "B" concert grand, in this twelfth-anniversary concert at Tuckerman Hall. 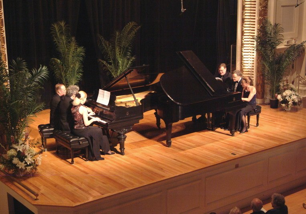 With pianists Paul Buono, Malcolm Halliday, Kallin Johnson, Sima Kustanovich, Olga Rogach, Myron Romanul, and Ian Watson. A dessert reception follows the concert. Order tickets early, as this concert sells out every year. Tickets, $25 in advance or $30 at the door. Use TICKET ORDER FORM or call (508) 754-1234. Tickets, $49 (floor table) and $39 (balcony) seating. 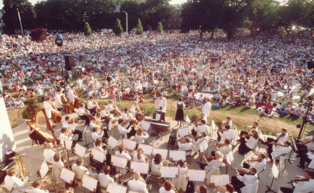 Copyright (c) 2018, Massachusetts Symphony Orchestra, Inc. All Rights Reserved. Friday, April 13, 2018, 7 P.M. 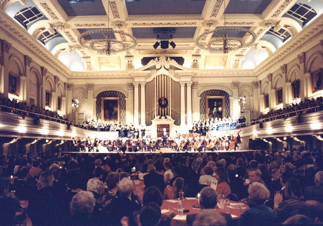 The Massachusetts Symphony performs in a benefit concert for JoyGuru Humanitarian Services, Inc. Also performing at this concert will be tabla and sitar players, and other performers. Tickets can be obtained from JoyGuru Humanitarian Services, Inc., 446 Main Street, Worcester, or from the Mechanics Hall box office.